This is the 50th post on this blog so I'm celebrating with 50 suggestions. 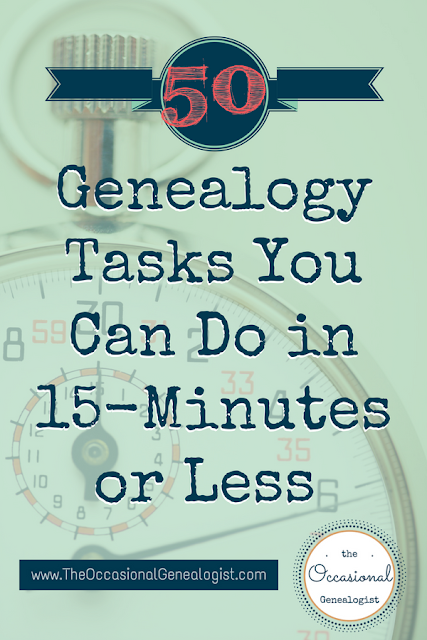 Since this blog is for Occasional Genealogists, these suggestions can be done in 15 minutes or less, or I suggest how to do them in multiple sessions of 15 minutes or less. Don't have time to read the whole post right now? 1. Update your research log with free online sources you want to check later. RELATED POST: 10 Easy to Search, FREE U.S. Record Collections. 2. Break a large research log entry into more sensible pieces (for digital logs, only! only break up an "analog" log if you aren't losing any of your original entry, remember, just as copying errors occur in the records we use, they can happen in our records, too!). Copy the entry and don't forget to cross-reference. Here's an image from my log (there are more columns) that could be split into a Patterson entry and a Godfrey entry. 3. Prepare your notes document (i.e. digital document or paper page) to match your research log entry for future research. Pre-enter the source and purpose of the search and any other items you normally save in both places. Be ready to record your research findings the next time you have 15 minutes! 4. Duplicate the research log entry for a large online collection and research just one narrow question. Make sure you make a note in the "larger" entry to tell yourself you've started one little piece of this research. If you've got your note taking form ready, this will be quick and well documented! 5. Create a "template" for research notes. There are lots of free forms out there. If you're going to create your own template, it should address your specific needs. Provide reminders for the information you often forget. 6. Start an education plan. It can be a list of classes, institutes, or conferences you want to attend, books or articles you want to read, or skills you need to learn more about. Make sure you can find this plan so you update it and use it. (there is an education plan template, in Trello, available in the Resource Library). 7. Use your education plan. Read an article, order a book from the library, register for a class, or just spend 5-15 minutes learning about a skill. If you need to learn about skills, you can also paste links into your plan to read later. 8. Cite a census record, maybe two. 9. Go through a pile of papers and file them. 10. Go through a file of papers and discard anything unnecessary, refile, split the file, etc. 11. Go through a file of papers and digitize them. 12. If your paper files are thick, prepare a digitization system so you can digitize in multiple 5-15 minute segments. 13. Cite something besides a census record. (If you won't be "publishing" you don't have to use a formal citation format, just make sure you have all the parts you need). Make notes of information your citation is missing. 14. 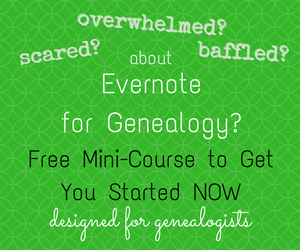 Learn why we write reports to ourselves in genealogy. 15. Create a report "template." This can be very informal, just provide reminders of what should be included. 16. Enter your narrow research focus/goal in several report forms. These might be related to one larger goal or from different "projects." 17. Outline the background information for one of your reports (you could also combine 16 and 17 by writing one narrow goal and doing the background outline for that report). 18. Gather the sources for the background outline you prepared. This might be gathering notes and document copies or just gathering the citations. 19. Create a list of citations for your report (both the background section and the new sources you used). If you will use endnotes for your report (instead of footnotes), you can go ahead and enter them in the report. 20. Start writing the background summary for your report. Don't rush. You may also need to create/start a section for questions you come up with while doing this. These may become a research plan or may just be minor issues you need to clear up. If you have to write your background summary in multiple sessions, the questions you come up with are a valuable product, record them! 21. Outline your report. This might be listing the sources you used so you can simply enter notes under each one and then write a summary or be an outline for a narrative. It depends on you and the type of research you performed. 22. Gather your citations and document copies or notes together for the body of your report. (You should only need your notes but you may be creating a report for research done by a past version of yourself that didn't take very good notes, it happens). 23. Double check if you are missing any citation parts. This might be a matter of making sure you understand what was included (or excluded) in the sources you used. Make notes if you need to learn more or go back to a source when you can. Depending on your report format, this might actually be a major feature of your report (issues with the sources used). 24. Start writing your report. Keep track of the questions you have. This is easier to do if you can find more than 15 minutes but better to do it in little bits than not at all! 25. Write a short summary of this report. You will use this and any appropriate parts from the background summary to create your next background summary. 26. Use your last report to start a research plan for the next phase of research. You should be able to quickly combine the report's background summary and the report summary to create the background summary for the plan. Make sure you have a sufficiently narrow goal or hypothesis to test. If you're creating a plan without having a report to start from, follow the suggestions under "reporting" to record a narrow goal and background summary. 27. If you've only got five minutes, start creating your plan with general source ideas. 28. If you have ten minutes, identify the specifics of a source you know exists. 29. If you have 15 minutes, research the existence of a potential source. 30. Prepare your research log and note template for a source you plan to use next. If you have to order a record, it still goes in your research log---even if they don't find it. 31. Include costs as part of your plan (create a budget). You can also include time (to use the record, order the record, a deadline to yourself, any "time" information you can provide). 32. 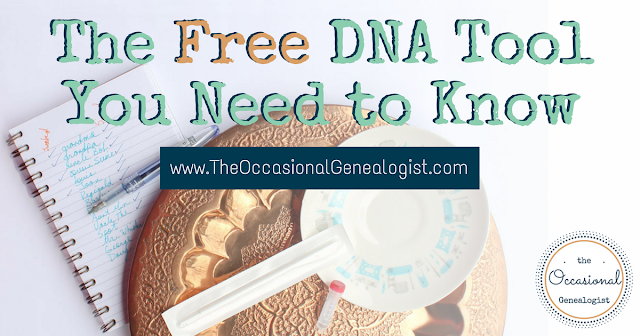 Determine if a DNA test could help with your genealogy research or (if you've already taken one), consider if there are additional relatives you could have tested. Create a testing plan. Don't forget to consider having an uncle or cousin take a Y-DNA test for you so you can explore another male line besides your father's line (the same applies to mtDNA for a female line). RELATED POST: Is DNA the "Magic Bullet" for Occasional Genealogists? 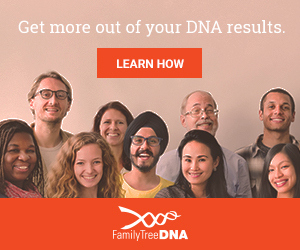 RELATED POST: Do I Need a Family Tree If I Take a DNA Test? 33. Get organized. learn about ways to organize DNA results or start setting up an organization system. 34. Upload your results to the FREE sites, GEDmatch and DNAgedcom. 35. Use tools (available at FTDNA, GEDmatch, and DNAgedcom) to do some analysis on your results. You may have to do this in stages (run a tool, later use the output). This requires your organization system be set-up. 36. Go through older photos looking for clues. 38. Organize and/or digitize your photos. 39. Learn what cousin baiting is if you've never heard of it. RELATED POST: Cousin Baiting, What Is It, Should You Do It? 40. Use Facebook for cousin baiting (set a timer if you don't want to spend more than 5/10/15 minutes on Facebook!). 41. 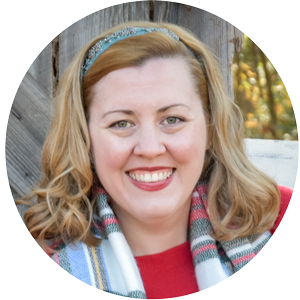 Start a blog as cousin bait (probably needs several 15-minute sessions but fewer than you might think). 42. Use a message board to find cousins or ask for information. 43. Identify a local family cemetery to visit or, see if a family cemetery has photos online. 44. If you don't live near a family cemetery, go for genealogical karma and look for a cemetery you can visit to photograph tombstones for others. 45. Get a kit together for cemetery photography. Besides a digital camera (which is likely your smartphone), you may need tools for dealing with grass or weeds, seasonal equipment (fingerless or touchscreen gloves in winter or sun protection in summer), and bug spray. A mini tripod and short stool can be helpful (or use a pickle bucket to hold your equipment and then it's the stool). 46. Practice using BillionGraves so you know how to use it when you get to the cemetery. It's a great tool of Occasional Genealogists because you can either take the pictures OR transcribe the pictures. It loads the photos to the correct cemetery if you use their (free) app correctly, which is easy. 47. Start planning a research trip. Identify a location where you want to visit or can do significant research. 48. Gather the items related to the research you would do on a trip. Have a way to keep everything organized and together at home so you don't have to take out/put away your material repeatedly. On your computer create shortcuts in one folder. For paper, use a binder or file box like this one. This box clicks shut which is what's important for "security" from your house mates, whether babies, toddlers, spouses, dogs, cats, teenagers, etc. I have almost this exact box. I like it is clear and in my less digital life, the office supply organizer on the top was very handy. I've had mine for probably 10 years and it's still handy although I don't use it as much now that I'm mainly digital. However, this box is getting harder to find. Amazon offers a similar product for under $10 for Prime members (so that's less than $10 shipped). BONUS USE: These boxes hold hanging files and I love mine for digitizing my paper files. I pull out the files I'm going to scan and store them safely in this box. After I scan, I discard anything I don't need to keep and refile what I am keeping. I also pull paper files to review for a single project and store them here temporarily (so I do use this box for taking out and putting away---since I don't take paper on research trips). 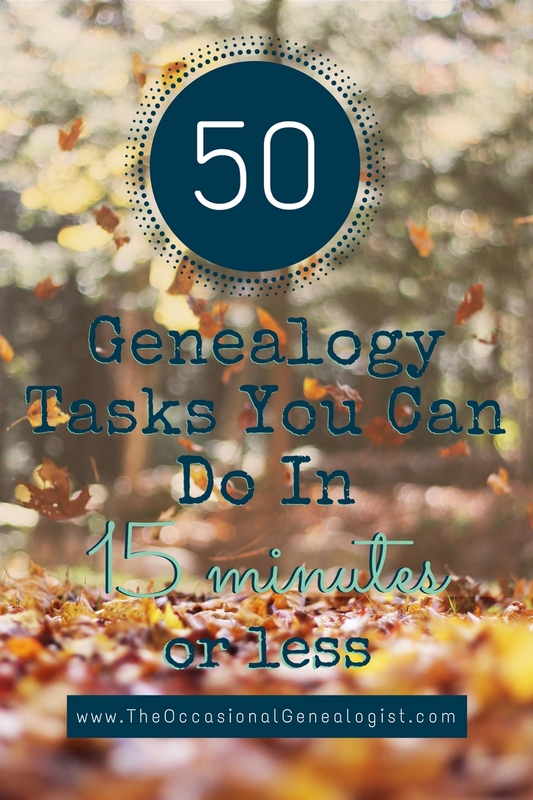 RELATED POST: Always Be Prepared, even if you're an Occasional Genealogist! 49. Clean-up your online tree. Have a system and keep notes so you clean the whole tree (or at least your direct lines). Learn how to merge duplicate people (instructions for online Ancestry.com trees). Fix typos or obvious errors. Make notes of other "impossible" information such as children born significantly after a father's death. If you can't "fix" it because you don't know what the problem is, it's a research project. This will take multiple sessions but can be done in sessions as short as one minute if you know where to start (i.e. where you left off). 50. Dream big. Identify your top goals or create a "genealogy" budget that covers any project in the next two years. The point should be to reach a larger goal like a major research trip, hosting a family reunion, or getting multiple DNA tests from relatives (in other words, you paying for multiple DNA tests for relatives). You'll never find the money for a big goal if you don't know what that goal is. You might also need to create some plans, write some reports, and organize some papers before it's worth spending the money on a big goal. You can figure that out in multiple 5-15 minute sessions if you keep notes. Perhaps you noticed the theme throughout these suggestions? If you only have small amounts of time, the way to accomplish a genealogical task is organization. 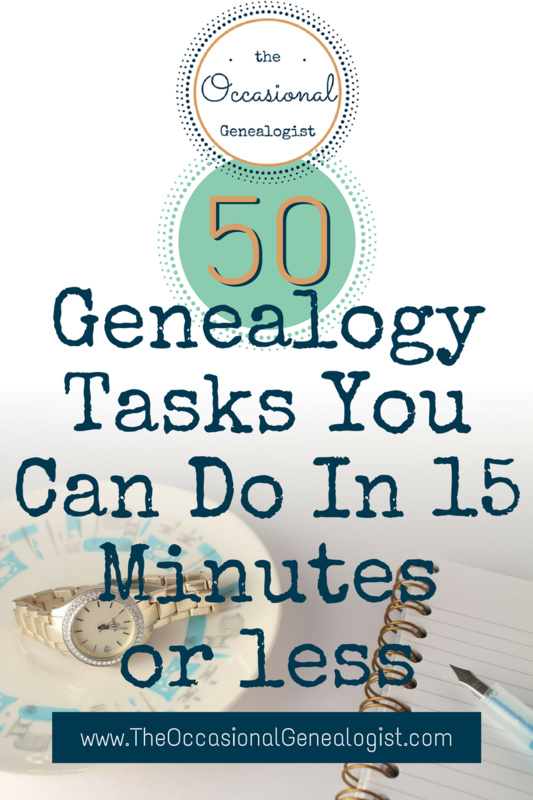 If you only have small amounts of time, the way to accomplish a genealogical task is organization. Most tasks related to researching require you take notes and be able to find those notes when you need them. Find a system that works for you. I like using Evernote for anything where I start with the question "where do I put this?" or "how will I find this again?" If I don't start with one of those questions, I probably have a place for that kind of information. If you still mainly use paper, you can create a finding aid on your computer to tell you where information is. EXAMPLE: Where do you put notes about your progress cleaning your online tree? In your finding aid, you would have an entry for your tree and it would tell you where the notes are. Your entry might be "online tree cleaning," or the name of your tree, or "Ancestry tree," or "MyHeritage tree," etc. By doing this on your computer, you can search instead of having to keep everything alphabetized or in order. I'm guessing if you're comfortable sorting a spreadsheet, you probably don't mainly use paper, so I'm not making that suggestion, although it's an option. Finally, when you just have little bits of time, it's ok just to have fun with genealogy. I always joke, no one's going to die, they're already dead. It isn't the end of the world if you occasionally don't follow all the best practices. You're doing genealogy for fun, right? The big picture is, it's no fun to be unsuccessful so you have to follow "the rules" most of the time. If you do go Googling a surname or searching a site without taking notes, that's your choice. That's kind of like watching t.v. What does watching t.v. accopmplish (I'll let you enter your own answer)? Sometimes you just need a break. For some of us, "searching" (instead of researching) is a break. Just realize, if that's the only way you do genealogy, you won't be successful in the long run. There are lots of 15 minute or less tasks you could do if what you want is success, not just a break. Know your enjoyment goal and pick a task that fits it, your time, and your research goals. Don't forget to to get free access to the Resource Library. Do you have suggestions for tasks you do in 15-minutes-or-less or break into 15-minute segments? Leave a comment. I have access to the Resource Library, but I'm not seeing the Trello template. I love Trello so I started to use it in my genealogy research. Do you have a Trello template? Thanks. For some reason the template wasn't there. I've fixed it now, give it a try. "Burned Counties" aren't always "burned"